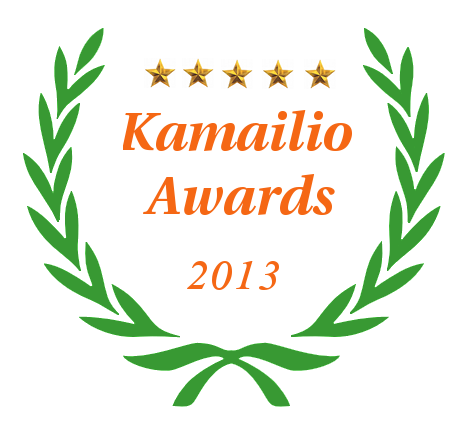 Here we are, the 7th edition of Kamailio Awards granted for the activity during the previous year, respectively 2013. The ceremony follows the same rule, two winners per category. With two major releases across 2013, respectively v4.0.x and v4.1.x, and having our first dedicated conference for Kamailio project, making the decisions for these awards was harder than ever so far. Ladies and gentlemen, next are the categories and the winners! mohqueue - by Robert Boisvert - rather interesting new module, allowing to use Kamailio for building call queues. A media server is needed only for playing music on hold, Kamailio taking care of queue management. Now your turn to build thousands of queues and blog about! Dan York - with a long record related to VoIP security, he does and extensive work at Internet Society in promoting new, better and more secure technologies for real time communications, such as IPv6, TLS/encryption, DNSSec. Dan constantly advertised Kamailio at world wide events and online articles about implementations of those specifications . David Duffett - running Telespeak UK and acting as Community Manager for Asterisk, David has been always highlighting the benefits of using Kamailio and Asterisk together as complement applications to get the best of what can be deployed for specific needs of large real time communication platforms. Definitely 2013 wasn't with bad luck for Kamailio at all and 2014 looks very well so far -- keep an eye on the project for getting latest news and updates on development and events world wide where you have have the chance to meet other kamailians. Looking forward to meeting many of you soon in Berlin, during the 2nd edition of Kamailio World Conference & Exhibition. Kamailio SIP Server v4.1.2 stable is out – a minor release including fixes in code and documentation since v4.1.1 – configuration file and database compatibility is preserved. Kamailio (former OpenSER) v4.1.2 is based on the latest version of GIT branch 4.1, therefore those running previous 4.1.x versions are advised to upgrade. There is no change that has to be done to configuration file or database structure comparing with older v4.1.x. We look forward to meeting many of you during April 2-4, in Berlin at Kamailio World Conference – complete agenda for the event has been published! Kamailio SIP Server v4.0.6 stable is out – a minor release including fixes in code and documentation since v4.0.0 – configuration file and database compatibility is preserved. Kamailio (former OpenSER) v4.0.6 is based on the latest version of GIT branch 4.0, therefore those running previous 4.0.x versions are advised to upgrade. There is no change that has to be done to configuration file or database structure comparing with older v4.0.x. Extra note to inform that in order to get 3.3.x packages hosted by the new APT repository, version 3.3.7 was released from branch 3.3. That should allow exiting deployments on 3.3.x to use the new repository and migrate easier to newer Kamailio releases. Beware that 3.3 is no longer officially maintained as stable branch, thus is recommended you upgrade to 4.0.x, or even better, 4.1.x. It has over 30 sessions presented by world wide speakers, from technical tutorials to business use cases, with topics such WebRTC, IMS, anti-fraud & VoIP security, scalability with OpenStack, real time charging, various Kamailio use cases, Asterisk, FreeSwitch and SEMS. The new build system for Debian and Ubuntu packages is now in place. This service is kindly sponsored by Sipwise, thanks to Andreas Granig – Sipwise is providing the hosting and man power to create and manage this new system. deb.kamailio.org is based on jenkins-debian-glue project running on AWS EC2 environment thanks to Michael Prokop and Victor Seva. All the needed files, scripts and info to reproduce this system are kept public at kamailio-deb-jenkins on Github. The web page at deb.kamailio.org presents all the repositories available. nightly builds are been built if a change is detected in the branch, once by night. Tags are not yet built, the next releases (4.1.2, 4.0.6 and 3.3.7) scheduled for later this week will get the appropriate packages.